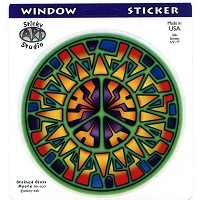 This colorful art decal features artwork by Mike Dubois. Here we see an orange and gold Sun which appears as a sunflower. The petals seem to be blown by a breeze as it happily sleeps with a smile on its face. Mike Dubois is one of the most popular artists to emerge from the Grateful Dead scene and now enjoys his success at his home in upstate New York.